CreateDir quickly generates a directory chain and then opens the terminal folder. So for example, setting "c:\temp\win\dir\" will create that folder structure and then open the "dir" folder in explorer. Useful for quickly creating folders for required system folders, demos, and other operations. The program includes a /q switch "Quiet Mode" for use with scripts and batch files. 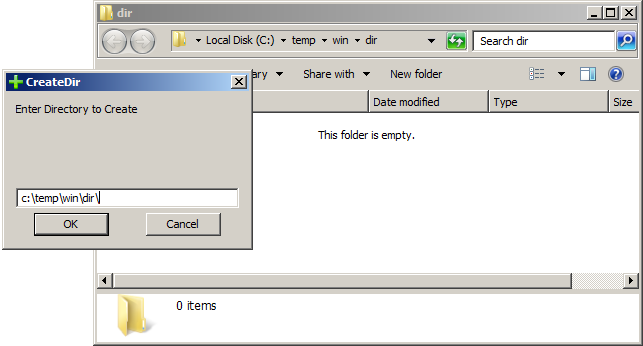 In this mode, directories are created without confirmation and not opened in explorer. Use /? switch for help dialog. How to extract: Download the ZIP package and extract to a folder of your choice. Launch CreateDir.exe. Added /q and /? command line switches. /q runs in Quiet Mode. Also accepts more than one directory on command line. If /q then the directories will be created without confirmation and the folders will not be opened in explorer afterward. Multiple directories on command line without the /q switch will confirm each and the folder will be launched minimized so that it doesn't obscure the input box for the next confirmation. ie: mkdir "c:\temp\sub\install\var1\home" && cd "c:\temp\sub\install\var1\home"